In the anguishing wait for a new kidney, tens of thousands of patients on waiting lists may never find a match because their immune systems will reject almost any transplanted organ Now, in a revolutionary study, researchers have successfully altered patients' immune system to allow them to accept kidneys from an incompatible donor. Sig nificantly, more of those patients were still alive after eight years than patients who had remained on waiting lists or received a kid ney transplanted from a de ceased donor. 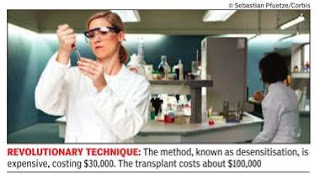 The method, known as desensitisation, “has the potential to save many lives,“ said Dr Jeffery Berns, a kidney specialist and the president of the National Kidney Foundation, adding that the procedure could mean the difference between receiving a transplant and spending the rest of life on dialysis.